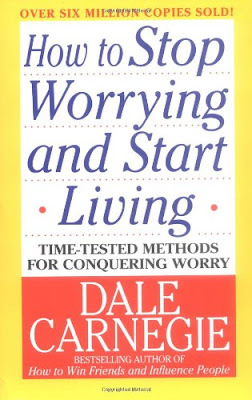 The book of the week was How to Stop Worrying and Start Living by Dale Carnegie. I think Carnegie is a genius and if you have read his work, there is a good chance you agree. This book is completely different from his other book I have reviewed How to Win Friends and Influence People, but still incredibly useful. I really like Carnegie's stories because since he was just a simple Missouri boy, all his stories originate from familiar places like St. Joseph, Omaha, or Minneapolis. And they are all great stories too! Let's begin with a simple prayer many of us have probably heard. This little prayer contains all the ingredients to help you stop worrying and... start living. Worry is a dangerous part of life. It inhibits so much growth. Growth in our emotions, growth in our relationships, and even inhibits us from growing physically healthy. There is nothing admirable about worrying.. Worry is, for the most part, irrational and everyone should be looking for ways to get rid of it. Worrying comes about for many different reasons. People worry about everything from not having enough money to not getting enough sleep. No matter what the cause of you worry is, to eliminate it you need to identify specifically what it is you are worrying about. Are you concerned about financial issues because you have heard there are lay-offs happening at work- if that's the case, since there isn't anything you can do about it, there is no need to continue thinking about it. A situation that used to worry me is sleep.. This example was given in the book too about someone else... I lay down and no matter what I cannot get myself to sleep. I laid there for hours and the rest wouldn't come and I am just thinking "I am only going to get 6 hours of sleep now, 5 hours, 4 hours... One night I decided to cast away all the worry and I convinced myself that nature would take its course and as long as I laid there with my eyes closed that I was getting rest. After I gave up worrying about the situation, there was no situation. Worrying about my lack of sleep was causing me unhealthy stress and once I decided not to let myself worry the problem went away. Identify the situation that is causing the worry... then decide whether you can do something about it or not (most cases you cannot do anything about it)... then act on the situation or forget about it. Ever so often your worry is manifested by a real situation that has real potential. If this happens just ask yourself the question of Willis H. Carrier "What's the worst that could happen?" Then mentally prepare yourself to accept the worst and be done with that worry. Usually the worst that could happen isn't nearly as hard on you as all the stress you inflict on your life and those around you by worrying. Another idea I liked in the book is living in "Day-tight Compartments." Only focus on what is happening today. Don't think about what could happen tomorrow. Just seize the day you are on and make something of it. Thinking about "what-ifs" doesn't get you anywhere. Live each day to the fullest until bed-time and then do the same thing with tomorrow's today. Carnegie even suggests putting the word Today in your car or on your bathroom mirror. Some people concern themselves with ingratitude. They get really upset that they did someone else a favor and they weren't thanked for doing it. I have seen these situations play out and they always end up with someone stressed beyond belief about something that should be perceived as very trivial. Carnegie mentions a story from the Bible to put perspective on this. In Luke, Jesus heals 10 lepers in one night and only one leper sticks around to thank Jesus for what he had done. Carnegie says if Jesus isn't thanked by everyone for what he did, then anything Carnegie isn't thanked for is not even worth thinking about. Everyone has the potential to worry, however, the best of the best have found ways to avoid worrying about things. Some people may remind themselves of a simple prayer like the one I used to start this blog and others may use a trick like taking a nap in the middle of their work day. Several people have made themselves more efficient and worry less by taking naps... John D. Rockefeller and Thomas Edison and Eleanor Roosevelt. They all turned out pretty successful. It's amazing how much reconstruction the body and mind can do with even a 15 minute power nap. Give this a shot and see how much more effective it makes you. The most important things to realize is that worry is real and it's not necessary. I think the most powerful way to conquer worry is to control your thoughts and to consciously think about not worrying about things. Sounds easy, but it can be. A man that I consider one of the world's greatest leaders, Marcus Aurelius, is quoted saying "Our life is what our thoughts make it." I wrote about the power of positive thinking last week, but I want to reiterate how powerful it is. You can be anything you want to be and do anything you want to do. I don't think that it's "just a coincidence" that the greatest leaders in the world agree with my perspective. Use the power of your brain to achieve everything you want... start with casting away any worries and then see what else you can do. This is an amazing book and the stories are really interesting. It would clearly be identified as a "self-help" book, but forget all the negative attention that goes toward such books and think of it as "helping your self." Take care of Number One (You) and turn around with that information and help anyone you think might need it. If you have any questions on the book don't hesitate to ask. I would be more than happy to help anyone that wants it.